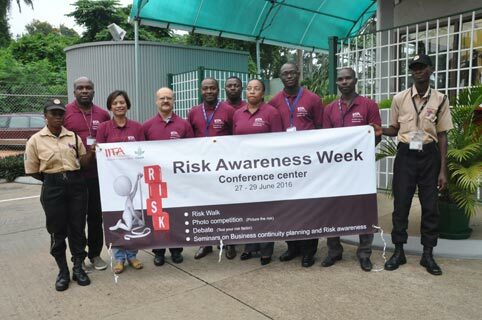 From 27 to 29 June, IITA hosted Risk Awareness Week across all hubs and stations. With the theme “Consider the risk, Improve IITA”, the week aimed to increase awareness on risk management and develop a culture of risk management among staff. Organized by the Risk Management Committee (RMC), the week included Risk Walk, interviews with staff, seminars on risk awareness and business continuity planning, a debate on “IITA risks: threats or opportunities”, a quiz contest (What’s your risk factor? ), and a photo competition called “Picture the risk”. The activities drew active participation from IITA staff at headquarters and the hubs/stations. DDG Ken Dashiell with the Risk Management Committee members flag-off the opening of Risk Awareness Week in IITA. The seminar presentations, given by RMC members, highlighted the importance of risk management in maximizing opportunities and minimizing threats. The presentations emphasized the inclusiveness of risk management practice, encouraging everyone to play an active part, and emphasizing that risk is everybody’s business. During the debate, the IITA community was able to critically engage one another in a discussion on the nature of risks, reflecting on how best to work with risks. Six teams, representing the sports fest colors, participated in the debate held at the Conference Center. As participants and judges of the photo competition, staff were able to identify potential risks present in their everyday work activities and suggest solutions to address them. The IITA community in Ibadan actively participated in the first-ever debate on risks. The week ended with the IITA community gaining an increased awareness and appreciation of the risks inherent in their daily functions and other IITA-related business processes. Risk Awareness Week is one of the strategies IITA undertakes to ensure risk remains a tool for improving business processes and practices, and puts importance on developing a risk-aware community. Risk management is also a major concern and priority of the IITA Board of Trustees and Management. RMC is chaired by Bussie Maziya-Dixon. The members come from critical units in the Institute and the hubs and stations.